A darling, tug at your heart, 5x7 greeting card for an adopted baby girl or baby boy. 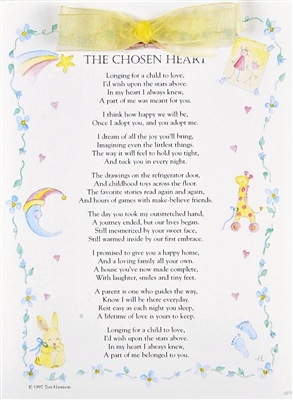 Give our Chosen Heart adoption poem to a family welcoming home a new little one- one journey ended and another beginning. Or use this as a special keepsake from the adoptive parents to their newest family member. "A lifetime of love is theirs to keep" as the poem will remind the child. Choose from a pink, blue or yellow organdy ribbon. The cared is blank inside for a special message and includes a white envelope. Our keepsake adoption card is suitable for framing or for saving in a baby book or scrapbook. 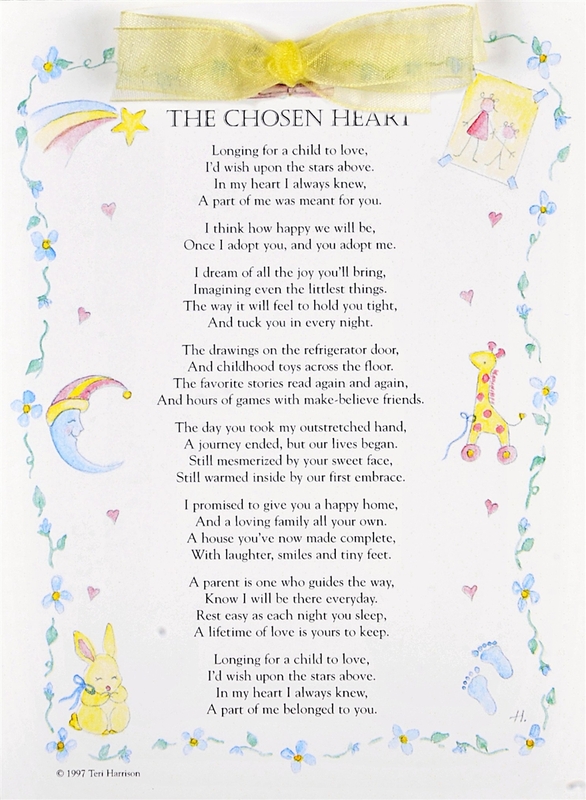 See our other Chosen Heart framed gifts. Website was very easy to navigate. Customer Service was exceptional.